What are the qualities that separate the winners from others? This is a wonderful topic which I am really excited in exploring. I have been a student of success in sports like tennis and cricket. I have in the past 5 years also researched the success secrets of business superstars like Steve Jobs, Elon Musk, Andy Grove and others. At the outset I don’t mean to say that you have to be a CEO to be successful but understanding what makes these people superstars is well worth a look. If we can incorporate some of those qualities we can reach our personal summits. Self-Discipline– There is nothing that is more important to be a winner than developing the quality of self-discipline. If you want to be a winner then it goes without saying that you need to do what winners do. My favorite role model is Rahul Dravid. He may not have the natural talent of a Laxman or Tendulkar but he made that up with sheer self-discipline and tenacity. Jim Rohn is credited with saying that the price of self-discipline is always lesser than the pain of regret. You can develop self-discipline if you have a burning desire to achieve something with your life. You can’t develop it without a clear blueprint of what you want your future to look like. Self-Direction– This means being absolutely clear on what you want to achieve. This is a critical quality of a winner. When Federer started playing tennis he had one goal and that was to win six grand slams just like his childhood heroes Stefan Edberg and Boris Becker respectively. This is not a bad goal and he has surpassed that goal by nearly 3 times. The key is he was absolutely clear on what he wanted to achieve. The only way to be self- directed is to set goals for every area of your life including personal, career, family and financial. Once you ignite the flames of your potential you can blast through any setbacks. Self- Esteem– This is the corner stone of a healthy personality. Irrespective of where you are in life understand that your life does matter and you are here for a specific reason. As Victor Frankl said in his amazing book Man’s Search for Meaning we shouldn’t ask what we want out of life, instead we should explore at what life is asking of us. This requires thorough soul searching from your end but once you discover your life purpose your self-esteem soars. A healthy self-esteem allows you to take setbacks in your way and keep looking at the big picture. Everyone including superstars like Federer has issues but they never allow that to bring them down. He has his critics but the thing I like about him is he goes for his goals and doesn’t get sidetracked. That is the only way to be a winner in any field of endeavor. 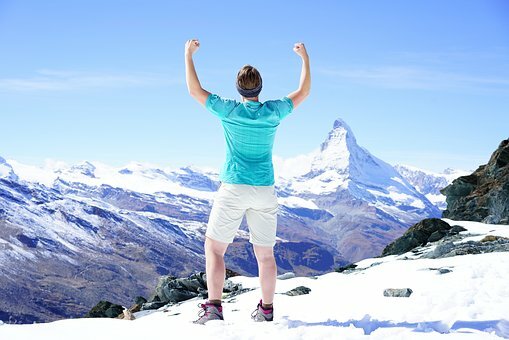 Self- Confidence– I have written in detail about self-confidence which you can find here 10 Keys to Self-confidence. The keys are appreciating yourself, writing down all the accomplishments you have had, going the extra mile, staying healthy, being comfortable in your own skin, having a positive personality and learning everything you can about your field. It is a quality that can be developed and it can help us get the most out of ourselves. Being clear about what your values are also helps in raising your self-confidence. You have no doubt heard the story acres of diamonds which was popularized by Russell Conwell. The main thesis is your greatest opportunities for life lies right where you are but most people miss it thinking they have to go far to discover it. The key is discover your strengths from where you are and if you can’t find it keep looking as you will find it. Self- Improvement– At the height of his prowess Tiger Woods changed his golf swing because he wanted the extra edge. Another great example is the double hundred Tendulkar scored in Sydney against Australia during the 2003-2004 test series where he completely played on one side of the wicket. He had only 82 runs from five prior innings and he didn’t play one drive through the offside in more than 10 hours of batting. It wasn’t pretty but he overcame his form slump with tremendous self-restraint. The key to being a winner is to address your shortcomings by constantly working on your technique or changing what wasn’t working earlier. Irrespective of where you are in your career or life you should not get complacent with your current success. Another example is Bill Gates who used to have think weeks where all he did was read and get up to speed on all the developments in his industry. There is no substitute for learning and this is an absolute must if you want to enter the winners circle. As Peter Drucker said “The only skill that will not be obsolete in the future is the ability to learn new skills.” No one could have said it better. Self-Reliance– It was Andy Grove who first said that you are the CEO of your career. This is a great attitude of a winner especially in business. You have to think of yourself as running a company with one employee yourself. This means you take complete responsibility for where your career is, keep upgrading your skills, build your brand (there are more avenues than ever to achieve this), and network relentlessly. You also should develop the habit of asking for what you want. Only if you ask you can get. Self-Reflection– Aristotle said “Wisdom is an equal measure of experience plus reflection.” It is absolutely imperative to have strategic time outs in your life maybe once a quarter or a month where you step back and evaluate where you are going, what is going well and what can be improved. What works for me is writing in a journal once in a week with what’s going well and what can be done better. This is a great way to know your strengths and shortcomings. The ability to keep getting better and better is the mantra of a true winner. Self-Honesty– Only you know everything about you. No one else in the world knows you as well as you know yourself. The key is to be absolutely honest with yourself. For example Rahul Dravid knew that he wasn’t doing well in One day cricket. He was always hitting great strokes but only thing was it was straight to the fielders. He didn’t sulk as he understood his weakness, was honest in his abilities and did everything to overcome his limitations. Well the results are there for everyone to see. He was the highest scorer in the World Cup 1999 held in England. He is a true inspiration that when you are honest about your weakness you can overcome it by developing yourself relentlessly. Self-Visualization – The one quality that absolutely separates the winners from the rest is their ability to visualize the positive outcome well before the actual event. When Federer goes into a match he is thinking of winning no matter who the opponent is. Of course he does lose but it is what he does after he loses that is the key. He looks to the future with great hope. He says I am already looking forward to the next tournament. The application for us is that before any event we should think of it going well and expecting the exact result we want. Review your past victories in similar situations. If it is a victory great, if not then look to the future event with hope while making corrections for the next event. Visualization is the key to passing an exam, completing a half marathon, nailing an interview and many other important events. Visualize yourself succeeding all the time and the results will be there for everyone to see. When you fail, look to the future with hope and keep visualizing till you achieve what you want. Self-Respect – Winners truly respect themselves for who they are and they don’t compromise their inner attitude to any outside interference. A healthy self-respect creates an aura of invincibility and puts you firmly in control of your life. Only when you value yourself will others value you. When we value ourselves we feel a lot better about life and anything that life throws at us. Self-Respect can be developed only by internalizing all the other qualities mentioned here as it is a result not a cause. A healthy dose of self-respect can bring our best selves to every encounter in our lives. Nelson Mandela is a great example of this. He was in prison for 27 years but despite all the hardships he never lost his self-respect. He came out stronger and was able to forgive everyone who had hurt him as well. This is a remarkable example of a man with great self-respect.